Since this is essentially a collection of photographs, the lack of a table of contents and page numbers is an acceptable transgression from the standard format one expects from a book. Even without those standard guides, the reader cannot help but be impressed by the astounding presentation this substantial work puts forth. "The most thrilling of all journeys - the missions of the Apollo astronauts to the surface of the Moon and back - yielded 32,000 extraordinarily beautiful photographs, the record of a unique human achievement. Until recently, only a handful of these photographs have been published; but now, for the first time, NASA has allowed a selection of the master negatives and transparencies offsite to be scanned electronically, rendering the sharpest images of space that we have ever seen. 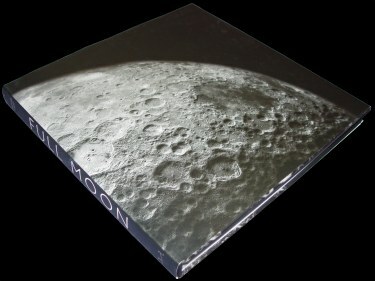 Michael Light has woven 129 of these stunningly clear images into a single composite voyage, a narrative of breathtaking immediacy and authenticity that begins with the launch and is folowed by a walk in space, an orbit of the Moon, a lunar landing and exploration, and a return to Earth with an orbit and spashdown. "Graced by five 45-inch wide gatefolds that display the lunar landscape, from above the surface and at eye level, in unprecedented detail and clarity, Full Moon conveys on each page the excitement, disorientation, and awe that the astronauts themselves felt as they were shot into space and then as they explored an alien landscape and looked back at their home planet from hundreds of thousands of miles away. "Published on the thirtieth anniversary of Apollo 11 - the first landing on the Moon - this remarkable and mesmerizing volume is, like the voyages it commemorates and re-creates, an experience both intimate and monumental."